It turns out the clock-gazing anticipation of a meal break affects even those who decide our civic fate, but with higher consequences than we may imagine. In a study published from the official scientific journal of the National Academy of Sciences, researchers found that judges rule more favorably either earlier in the day, or right after meals. And not just slightly more favorably —a prisoner whose case was heard immediately after a meal break could have a 65% higher chance of getting a favorable ruling than a prisoner who came right before a break, when chances could drop to 0%. 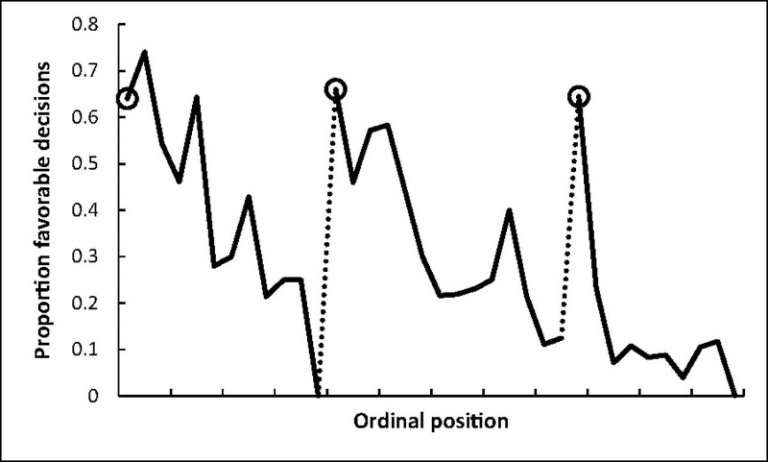 Proportion of rulings in favor of the prisoners by ordinal position. Circled points indicate the first decision in each of the three decision sessions; tick marks on the x-axis denote every third case; dotted line denotes food break. The data used consisted of 1,112 judicial rulings over a 10 month period, with the majority of decisions consisting of parole requests or changes in parole terms. Researchers controlled for crime severity (crimes ranged from embezzlement to murder), prisoner demographics, months served, previous incarcerations, and the possibility of a rehabilitation program. Judges did not know the details of the case beforehand, and took cases depending on the arrival time of the prisoner’s attorney. The judges spent approximately six minutes on each case. The drastic difference between rulings is shocking. Given how we expect seasoned judges to act — that is, unbiased, objective, rational, and without emotion — it is unnerving to think that something as seemingly inconsequential as a recess break could have such a profound effect on a judge’s decision-making capability. What would this imply for the rest of us, unseasoned as we are in keeping our biases in check? While the study has received pushback in its chilling conclusions, the results remain relevant. Regardless of how trained we are at a certain task, factors beyond our control that affect us psychologically have a stronger grip on us than we like to admit. This is true across demographics: a 2009 study found that 8–9 year olds with more than 15 minutes of recess a day exhibited better classroom behavior, and the effects of burnout and the importance of lunch breaks are becoming more accepted in the modern workplace. We like to think that we are rational creatures when called to the task, but the opposite is more often the case. Nevertheless, it is interesting to compare the performance of judges to the performance of nurses, whose daily schedules are arguably more mentally and physically draining. A 2004 study on the effects of work breaks on work staff performance found that nurses that skipped breaks and/or meal periods did not make significantly more mistakes than nurses that took these breaks. Of course, this is not an apples-to-apples comparison; there are many, many factors that could surely be studied to pinpoint why judges, students, and office workers seem to be more affected than nurses. And, as the study notes, nurses gain other benefits from breaks. Yet, it is a curious case and makes us think, is there something to learn from nurses? Another approach is not so much what we can learn from nurses, but what we can learn from the experiences of judges, students, and office workers. The mental and physical exhaustion common in modern day to day institutions — schools, workplaces, courthouses — should imply that the schedules we’ve created for ourselves do not work. It is unnatural, and rather than adapt to the norms that were arbitrarily created (after all, “weekends” were unheard of until the last century), perhaps it’s time to consider adopting new norms.